A boutique-style 40-room Inn located on the water at Thames Street Landing in Bristol, Rhode Island. The waterfront setting offers guests views of Narragansett Bay. 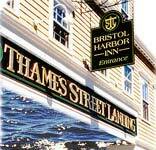 70-foot dock is available for use by guests of Bristol Harbor Inn and Suites. The dinghy dock is also available to those coming to Bristol by water. Select from single rooms with King or Queen-size beds, double rooms with two full-size beds, or two-room suites with sitting room and separate bedroom. Heritage with all the expected modern amenities, including air-conditioning, full baths, cable television and telephones with data ports. The meeting room will accommodate up to 120 people. The room is fully equipped for audio/visual presentations and internet access.